8th of March is International Women’s Day. Here in the library, we make a week of it. 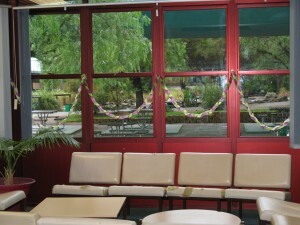 In 2011 IWD was on a Tuesday so we started decorating on the previous Friday by blowing up balloons and plaiting streamers. 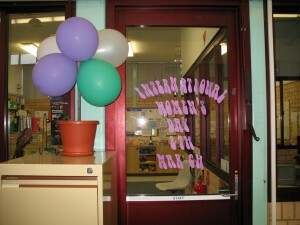 The colours of International Women’s Day are Green White and Violet/ Purple. If you did not know why these colours represent IWD the reason is simple- Green represents Give, White represents Women and Violet/ Purple represents Vote- Give Women the Vote. The three colours were used by Women protesting for suffrage- the Suffragettes. 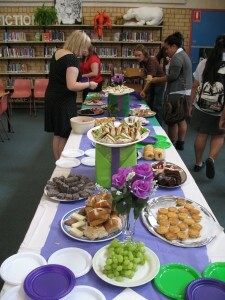 As the Librarian, it was delegated to me to organise the IWD staff morning tea- we held it on the Friday of the week when we normally have staff morning tea. The decorations are balloons, crepe ribbon, plastic tablecloths and the music included Sister Sufferagette from Mary Poppins.